Is kale healthy for guinea pigs to eat? Is kale bad or good for guinea pigs? What can health benefits guinea pigs have from kale? Guinea pigs are the most adorable pets that many pet lovers love to have them. These small and fluffy pets want your attention and love. While introducing any new treat to your guinea pig, you need to very careful as guinea pigs have a sensitive stomach. If healthy food is not offered to them, then they can easily suffer from digestive problems. What are vitamins and nutrients in Kale? Can Guinea Pigs eat Stems of Kale? What are Varieties of Kale for Guinea Pigs? How to Introduce Kale to your Guinea Pig? Kale or also known as leaf cabbage is a dark green vegetable. It is considered the healthiest food for human. This vegetable comes from the cabbage family, includes cauliflower, broccoli, and collards. It contains a wide variety of vitamins, protein, and minerals. Kale has many nutrients, and that’s why it is one of the healthy green vegetables for human and guinea pigs also. If you asked many guinea pigs owners about feeding kale to guinea pigs, then you will get different opinions. However, experts have proven that kale is an excellent green treat that can be offered to guinea pigs, but yes, moderately and occasionally. There is no doubt that kale is a fresh and nutritious vegetable and however, you should never ignore the fact that excess of everything is terrible. Thus, guinea pigs can eat kale, and you should give this green treat to your pet in a moderate amount. This will be good for your pet digestive system. It is also not necessary that every guinea pigs like to eat kale. They are one of the picky eaters, and some may love to eat kale or some may not. 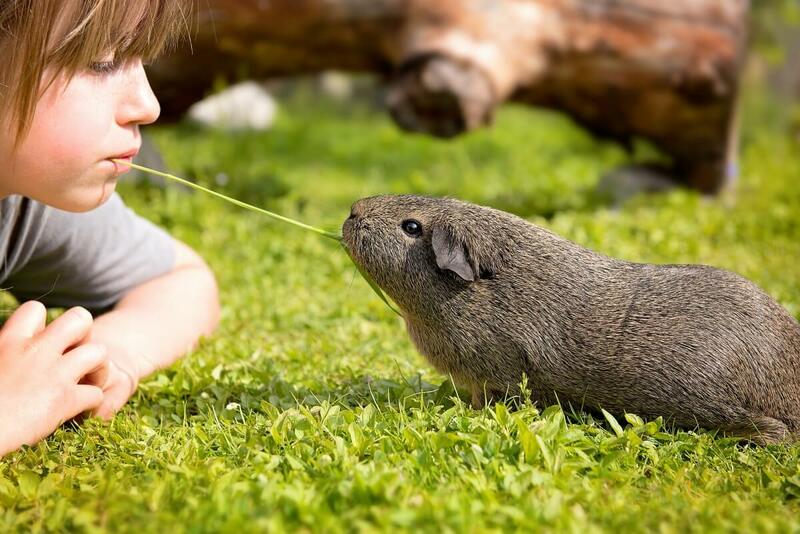 Mostly food preferences develop in guinea pigs at a young age. Thus, if you have an older guinea pig, then he may not like to eat kale, and he may reject to eat it. The primary nutrient that kale contains is vitamin C, and this is the most vital vitamin that guinea pigs require to stay healthy and fit. It is because guinea pigs are not capable of producing vitamin C on their own in the body. That’s why many experts suggest guinea pigs owners look for vegetables that are full of vitamins and nutrients. On the other hand, kale also contains calcium and phosphorus that is not good for your guinea pig. That’s also the reason why kale should not be given to feed on a regular basis. Otherwise, it can disturb your pet digestive system. Moreover, kale also contains vitamin K and A. It is an excellent source of fiber, and it is low in sugar and fat. These all qualities of Kale make a beneficial food for the health of your guinea pig. And, always remember that your pet requires food that includes dietary value. You may have seen guinea pigs chewing on the stems of Kale or other green vegetables. We generally discard stems of kale while cooking it for ourselves. However, stems are suitable for guinea pigs, and more importantly, their roughness can aid in keeping your pet teeth grow. Thus, all parts of the kale are edible for your pet. A mixture of stems and kale leaves is a perfect treat you can give to your guinea pig to eat. Are you now wondering to know what varieties of Kale for your guinea pig are? You may have seen in the grocery store that has a wide selection of kale. You may have noticed various different kinds of kales in the market. This all things can make you think “Can your guinea pig eat all varieties of kale”? Let me tell you nutritional level is almost the same in all varieties of kale. Some kales have curly leaves, some are of Italian styles, and some are like a reddish purple. However, in the end, no matter which type of kale is, you can introduce to your guinea pig. It depends on your pet whether he/she likes it or not. Many guinea pig owners prefer to take a suggestion from their vet when it comes to how much quantity of kale should be given. Most veterinarians recommend that guinea pigs should be given kale on a weekly basis. But, if you are going to provide kale to your pet for the first time, then you should give in very less amount. Or you can mix kale with your pet favorite treat. While introducing kale to your guinea pig, monitor your pet reaction. You will get to know whether he/she likes it or not. If your pet loves it, then you can give this green treat to your pig occasionally. It is also recommended that don’t give cooked kale to your guinea pig ever because guinea pigs can’t digest cooked food. Thus, it can disturb their digestive system very badly. Always give raw kale that will maintain your guinea pig health. Before giving kale to your guinea pig, must wash vegetable properly with fresh water. Removing chemicals or pesticides present in the vegetable is essential. Feeding unhealthy food can lead your guinea pigs to suffer from various health problems. Always clean uneaten kale on a daily basis to prevent bacteria and mold. Also avoid kale with oils, dressings or seasonings for your guinea pigs. In the end, kale is a good food option for guinea pigs, and they can have many health benefits from kale. However, you should not give kale to your guinea pigs every day as calcium present in kale is not good for guinea pigs health.